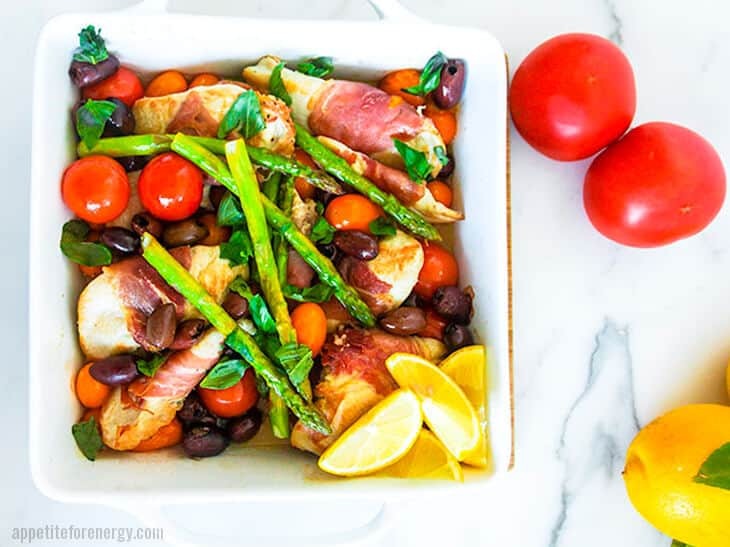 Keto Prosciutto Wrapped Italian Chicken delivers maximum Mediterranean flavor in just ONE PAN. 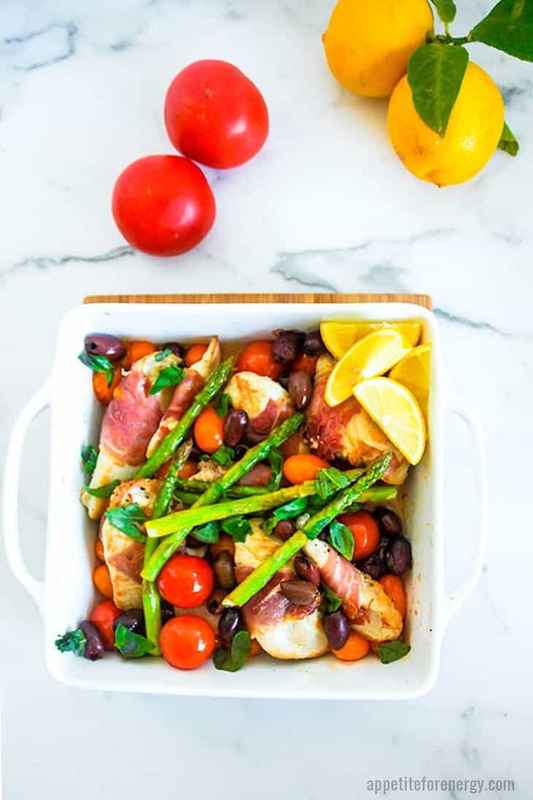 Nestle tomatoes, olives and asparagus around a centerpiece of prosciutto-wrapped chicken and take a trip to Italy tonight! This is a really fun oven baked chicken recipe that I’ve been cooking various versions of for years. 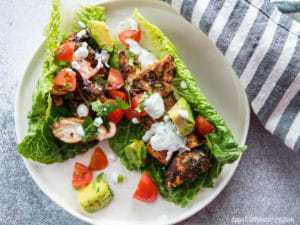 If you’re looking for an easy keto chicken recipe for dinner then this one ticks all the boxes. Easy? Yes, the recipe uses simple everyday ingredients and ONE PAN. Quick? Yep, it’s ready in 30 minutes and uses only one pan so less washing up! Tasty? Of course. 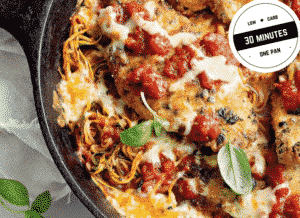 This quick chicken dish has layers of flavor to tempt your taste buds. Bold prosciutto combined with delicate chicken breast and the salty olives bring this Italian chicken recipe to life. Add in the tomatoes and a generous grating of parmesan cheese and you’re driving a moped down the Via Del Corso. Low-Carb? 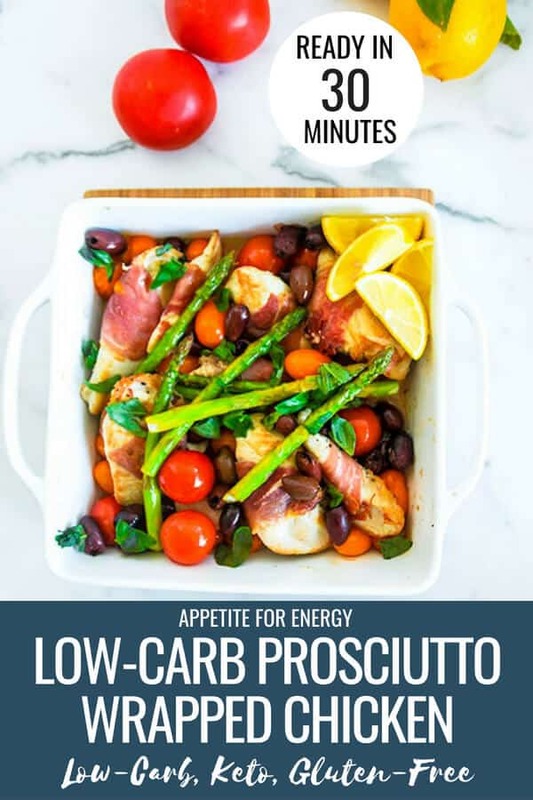 The recipe is low-carb, keto diet friendly and gluten-free too. There’s no need to cook a vegetable side dish as you roast tomatoes and asparagus along with the chicken. It couldn’t be easier. Swap in other vegetables that you like – see Cooking Tips below for suggestions. I’ve often thought of this as a summer recipe because of the Italian flavors and ingredients. But the reality is that I cook this dish all year round or at least anytime that asparagus and tomatoes are plentiful. Ask the kids to help wrap each chicken piece with the prosciutto. It doesn’t need to be too precise because the dish is cooked in the one pan. If a piece of prosciutto falls off, it will still cook nicely in the pan, whether it’s attached to the chicken or not! 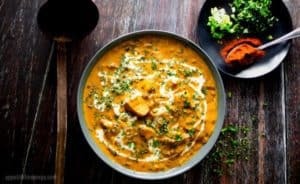 If you’re looking for more quick, healthy, keto chicken recipes, try our 30-Minute Low-Carb Butter Chicken Curry. Bake in the oven (if using an oven-proof fry-pan or skillet) for 13 minutes or until the chicken is cooked through. No oven-proof pan? Transfer the browned chicken to a baking dish and add the rest of the ingredients to the baking dish before baking in the oven for 13-15 minutes or until chicken is cooked through. Tip for preparing asparagus – to trim asparagus quickly, simply bend the stem at the woody, thicker end, and it will break off. Discard the thick end. No ovenproof skillet? 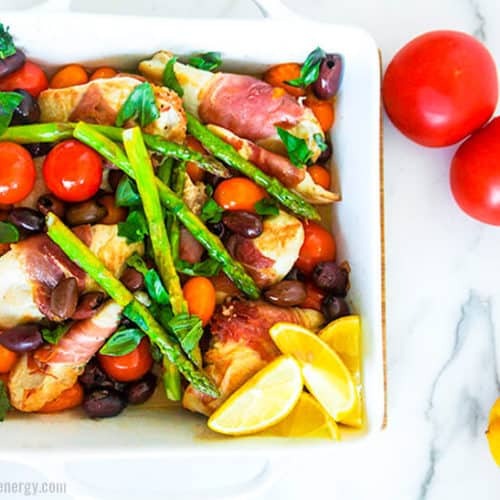 Transfer the browned chicken to a baking dish and add the tomatoes, asparagus and olives. Pour in the stock and lemon juice and bake in the oven for 13-15 minutes or until chicken is cooked through. Leftovers? The prosciutto wrapped chicken is delicious reheated the next day for lunch. It will keep in the fridge for 2 days. Different vegetables? Instead of asparagus and tomatoes, try adding broccoli florets, bell peppers cut into thin strips, sliced onion or zucchini rounds or sticks. Want to use bacon instead? Secure bacon strips to the chicken breast with toothpicks and allow 2 minutes per side to brown in the frypan. As the bacon is thicker than prosciutto, the chicken may take slightly longer to cook. Wrap bacon strips around chicken breasts and secure with toothpicks. Cook for 2 minutes per side to brown in an ovenproof frypan. Transfer pan to the oven at 200°F and cook for 20 minutes or until chicken is cooked through. WHAT IS THE DIFFERENCE BETWEEN HAM AND PROSCIUTTO? Prosciutto and ham are both made from the hind leg of a pig but prosciutto has been dry cured using salt and occasionally spices. The prosciutto is air-dried for varying lengths of time from a few months to years and usually served uncooked. It can be eaten uncooked due to the lengthy curing process. Ham can be wet or dry cured and it is sometimes smoked. HOW MUCH CARBOHYDRATE IS IN TOMATOES? One cup of red cherry tomatoes contains 4.8g of net carbs. Yellow tomatoes have the lowest amount of carbohydrates at 3.1g net carbs per cup. Tomatoes are considered to have a moderate amount of carbohydrates so you need to keep an eye on quantities if you are watching your carb intake. Tinned tomatoes also contain a moderate amount of carbs so use in moderation. Yellow tomatoes are lower in carbs than red and green tomatoes, so buy yellow where possible! They are great for low-carb and ketogenic diets in small amounts. For more info on the foods that you can eat on a low-carb diet click here. 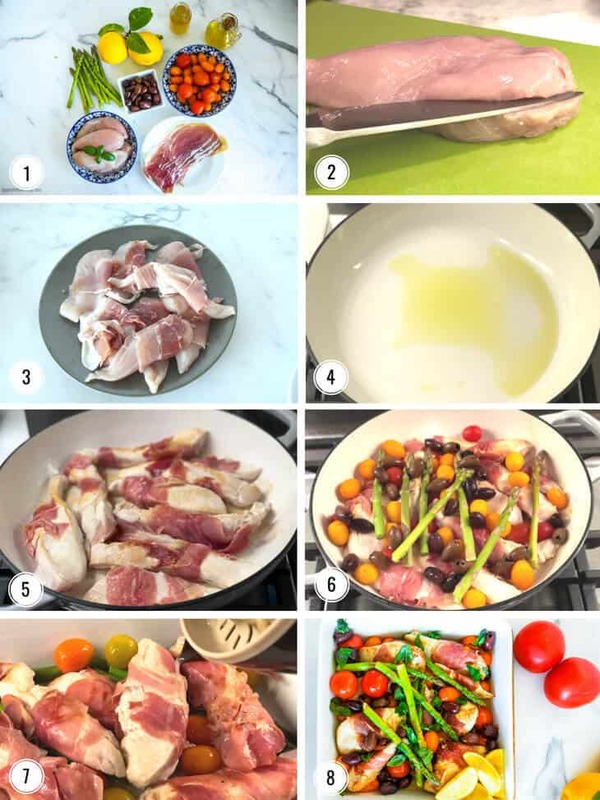 Low-Carb Prosciutto Wrapped Italian Chicken delivers maximum Mediterranean flavor in just ONE PAN. 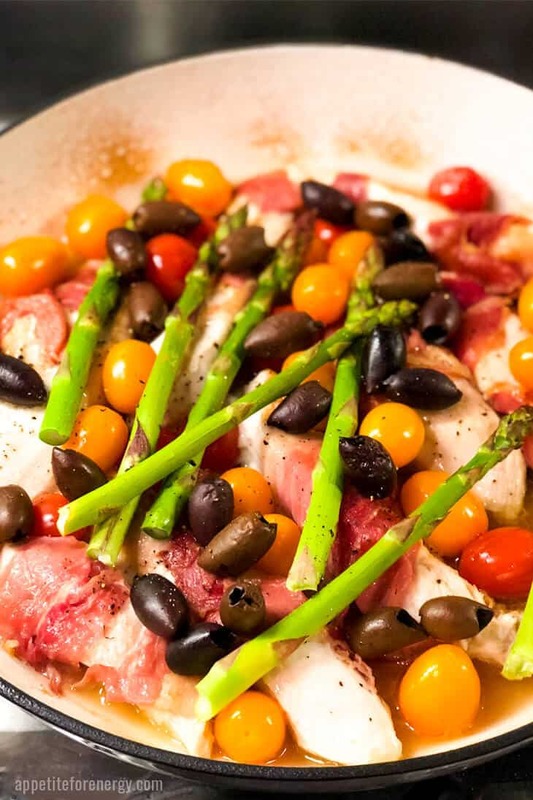 Nestle tomatoes, olives and asparagus around a centerpiece of prosciutto-wrapped chicken and take a trip to Italy tonight! Tip for preparing asparagus - to trim asparagus quickly, simply bend the stem at the woody, thicker end, and it will break off. Discard the thick end. This post was originally published in July of 2017, but was republished with simplifications to the recipe, step by step instructions and extra tips in September of 2018. This tray bake is bursting with flavour. I love all the veggies you have packed in to it too. There’s lots of veggies and you can add in different veggies too like cauliflower or broccoli. Love the sound of this, those tomatoes look like absolute perfection too! I hope you love it, Amy! I love simple one pan recipes – especially like this one with a ton of flavors! This looks like such a tasty and flavourful meal for the whole family. I love that it doesn’t take too long to make and is low carb too! This looks so delicious Abbie! Quick and easy, right up my alley!